Consider Our Pants Blown. In A Good Way. I wasn’t going to write about food today. I was going to write about our trip to Omaha or rant about drivers who don’t use their turn signals or the fact that we’re tackling our house to-do list with renewed vigor, but I had such a gastrogasmic experience this weekend that it would be sin — sin! — not to tell you about it. 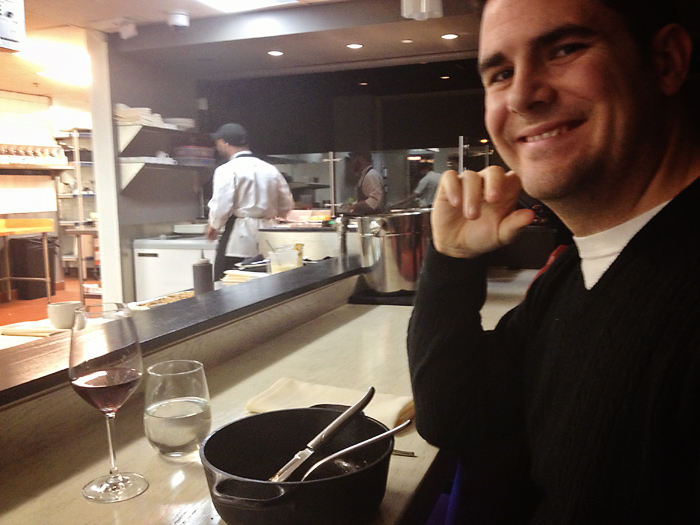 The thing is, you’re probably already aware of the fact that Justin and I are drawn to “fancy” restaurants. Not necessarily required-to-wear-a-collared-shirt fancy, but interesting-and-privately-owned-and-passionate-about-their-food kind of fancy. The we-don’t-have-to-follow-a-corporate-developed-menu-because-we-cook-what-we-want kind of fancy. From Biker Jim’ Gourmet Dogs in Denver to Limones hole-in-the-wall fusion in Asheville, we’re willing to try anything, as long as it falls within budget. So, when we realized we had to make an impromptu visit to the Raleigh/Durham/Chapel Hill area of North Carolina — locally known as “The Triangle” — to retrieve the tripod I’d left at a friend’s place, we decided to make the most of the hike and visit a local restaurant. Landing last-minute Saturday night reservations at a decent dive is no easy feat, but Open Table pulled through for us on a place we’d never heard of in Chapel Hill, called [One] Restaurant. Here’s a little tip from me to you: You know a place has to be good if the name requires special punctuation. Brackets, asterisks, and sometimes even the lowly ampersand — as long as it’s not a dollar sign (*cough*Ke$ha*cough*), you know there’s quality involved. The punctuation is as good as culinary gold. Oh. But if you find a restaurant with a period in the name, beware that it could be the equivalent of Ron Jeremy walking around with his fly open. We already know it’s going to be big, based on the hype and the bulge, so the open fly is overkill. Confidence turned cocky. And that’s never a good thing. Which is a very good word. The place is located in this tiny outdoor shopping center — a series of strip malls, really, but the kind with condos above them that should theoretically make the area a hopping place on a Saturday night, but it was eerily quiet. The restaurant itself was equally empty at 6:30, which surprised us since we were unable to get a reservation at 7:00. Assuring us that the massive dining area would be teeming with diners shortly, which is why we couldn’t get a later reservation, the hostess guided us to a table near the very back. Is it because we’re wearing jeans? we thought. It’s because we drove the Tracker here, isn’t it? If there is one massive peeve I have about upscale restaurants, it’s their tendency to immediately judge based on age and attire. Sure, we were wearing jeans, but they were nice jeans with dressy sweaters. I was wearing dangly earrings, for crying out loud. And lip gloss. But it felt like because Justin wasn’t wearing argyle socks and I didn’t reek of Chanel and hair spray, we weren’t worthy of front-and-center seating. At least we weren’t stuck in the way back, which was an area of twenty or so tables completely secluded from the rest of the dining area. I suppose that was reserved for the people who looked really poor. After we were seated, our impression didn’t improve much. Our waitress was somewhat haughty, essentially making fun of us for studying the menu with intensity — not because she envisioned us eccentric, indecisive foodies, but because she knew we were relatively fresh and unknowledgable about our options. She was the perfect server, really, for the argyle-Chanel wearing bunch — and her knowledge of the menu and suggested wine parings was impressive. And she really wasn’t rude or anything… just a little condescending. Of course, that could’ve just been my own insecurities talking. Either way, she didn’t make us feel comfortable. And if I don’t feel comfortable before I spend a substantial amount of money on a culinary experience, it’s ruined before it even begins. 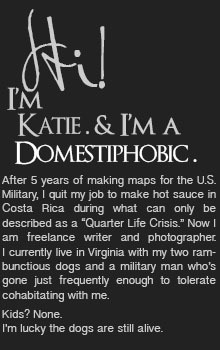 *Note: I apologize for the fuzzy phone pictures. 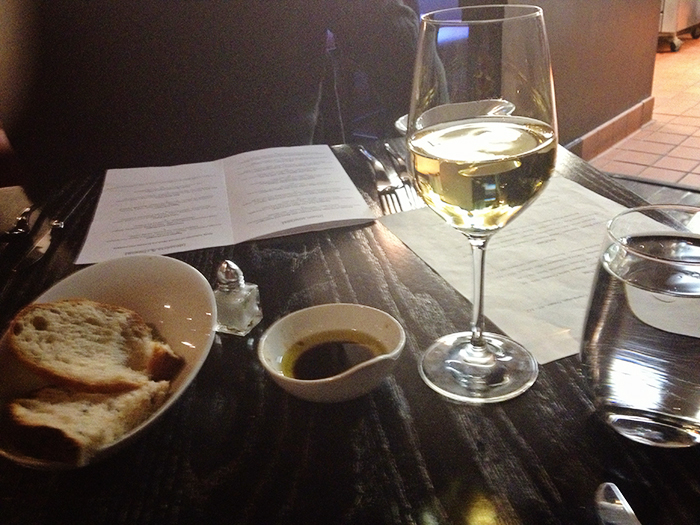 One of these days I’ll be brave enough to bring my DSLR camera into nice restaurants. I just need to accept the fact that I’m THAT girl. Noticing the vast (and also very empty) food bar in front of the huge, open commercial kitchen, I asked her if we could sit there. 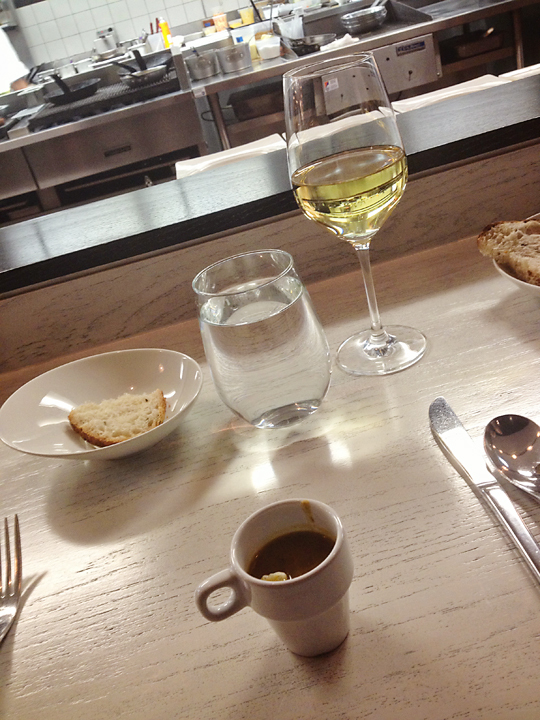 She seemed almost relieved at the request, leaving us to move our own glasses and bread (with the help of the decidedly more relaxed water-filling waitress) to a part of the restaurant where — all parties could agree — we more obviously belonged. 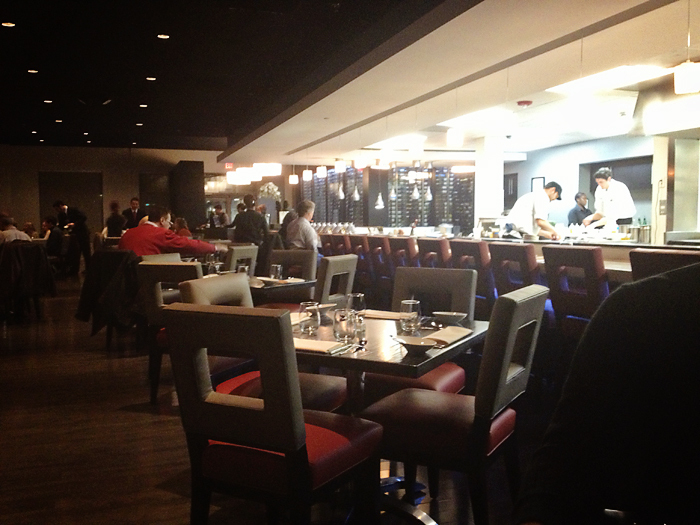 Dark, half-empty dining room on left, or exciting, bustling food bar with a view on right? Take your pick. And that, my friends, is where we turned a 180. Up at the food bar, with our backs to the relatively drab and lifeless dining area, we were able to see the real action. 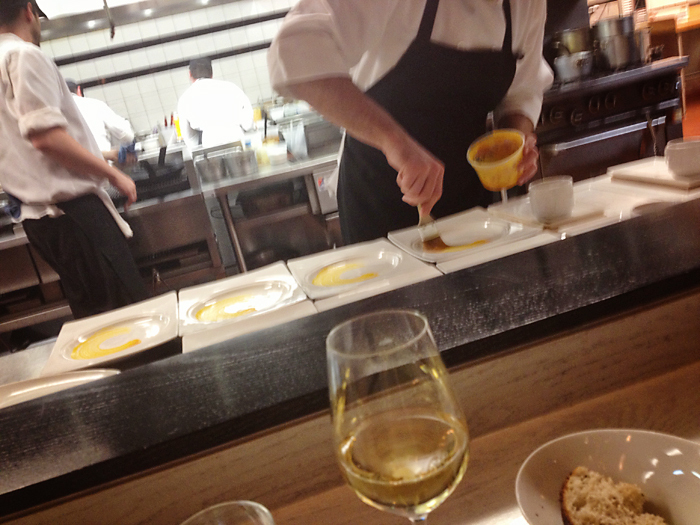 Talented chefs, hard at work before our eyes, and a plethora of friendly wait staff making sure we were taken care of. 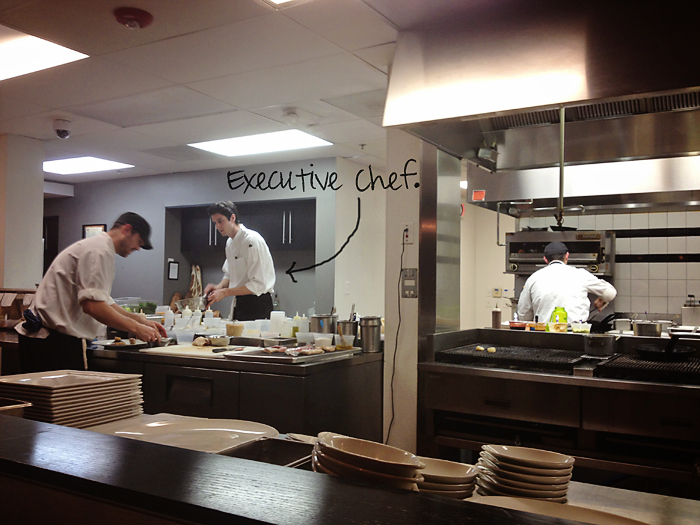 Our original server was kind enough to stop over and point out Sean McCarthy, the Executive Chef of [ONE]. The 7-foot tall (??) man working the salad station was hard to miss. As was this guy, the man working the dessert station directly in front of us. Here he is, busy as can be, but still taking the time to explain to us the intricacies of milk noodles. I feel terrible I didn’t get his name, but I did give him the name of my blog, so if you’re out there reading this dessert guy, let me know. You. Were. Awesome. For all of the interesting places we’ve tried in our travels, I’ve been searching for something. That elusive, unnamable thing you stumble upon when you least expect it — more than a taste, but a feeling of something. Something divine. Something you can’t get at most restaurants, no matter the price tag. The best way I can explain it is a layering of flavors. Where every bite that enters your mouth has a flow. It’s not just one bite with one taste, but an experience. And we got that here. If you’re unfamiliar with dining at fancy, schmancy places, just know that it’s not uncommon for them to serve up a little amuse bouche, or a tiny (and complimentary) little hors d’oeuvre to whet your appetite for the coming meal. I cannot remember exactly what this was, just that it was a delicious and bean-tasting cool soup with citrusy chewy rice. Sounds awful? It wasn’t. It was deep. Layered. Wonderful. 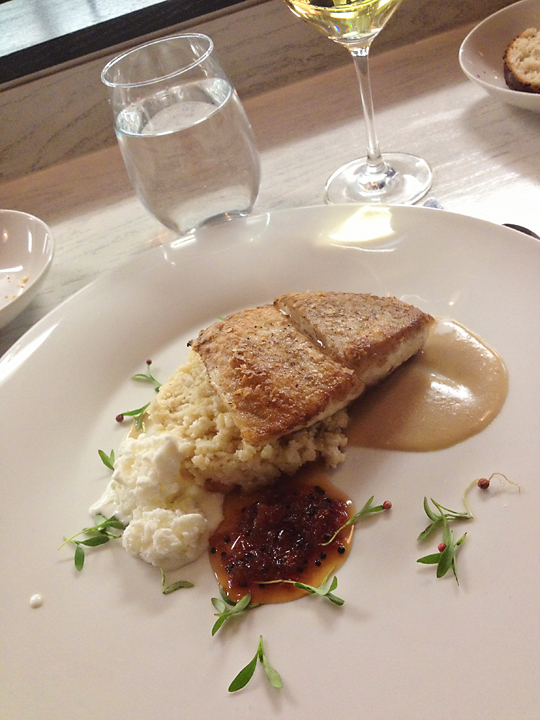 I ordered the Potato Encrusted Alaskan Halibut with Cauliflower-Almond “Risotto” for my main course. At first, when I took a bite of just the halibut and cauliflower concoction, I found it a little bland. Disappointing. But I quickly realized that was my mistake — not theirs, because there was a medley of other accoutrements on my plate that weren’t there for just decoration. They were there for layers. 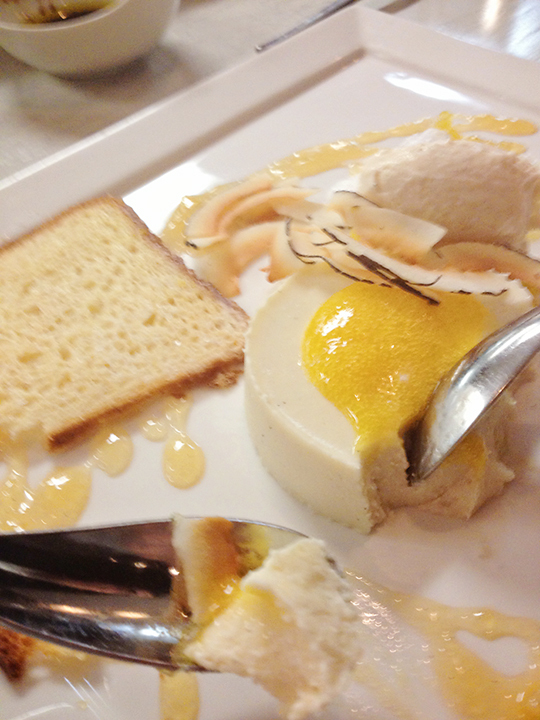 Roasted butternut squash, grapefruit and Asian pear chutney, a kind of brown butter coconut gravy, and a marscapone cheese ice milk. Each flavor complemented the next. Each was subtle. Each was delicious. 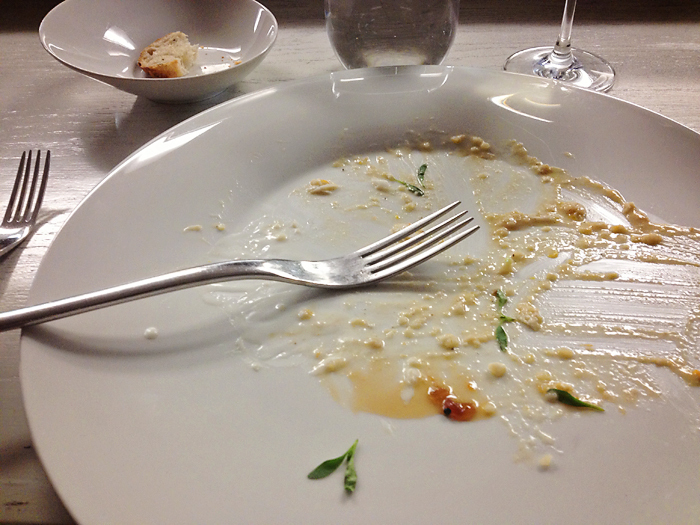 I almost licked the plate. Almost. Again, the layers. We had one very satisfied customer. Don’t worry. This wasn’t real eggs and toast, but a coconut-guava panna cotta (kind of a thick custard that looked like the “egg white”), a pureed mango “yolk,” shaved coconut to look like bacon, and other fancy, nonsensical things like brioche, pineapple confiture, horchata ice cream, and rice milk espuma. Don’t worry. You don’t have to know what it is to thoroughly enjoy it. 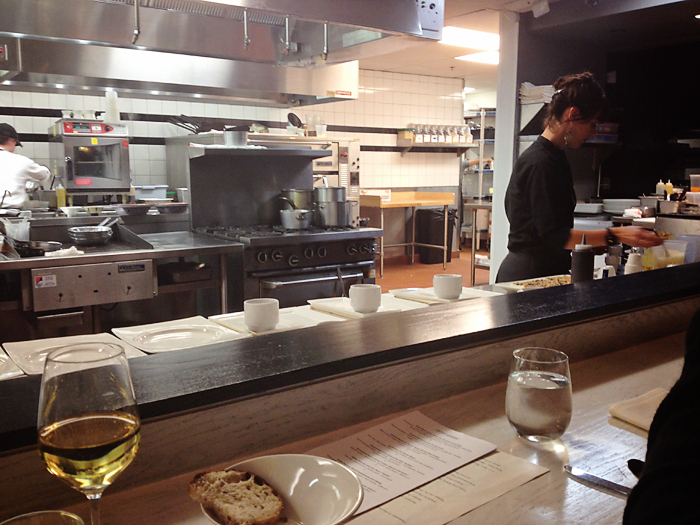 The coolest thing about sitting in front of an open commercial kitchen, just like we did at Cúrate in Asheville, is grasping the complexity of what these people do. You can put faces and hands to the people who created the meal in front of you and stare in awe as they plate a dozen or so desserts with paint brushes and food molds while remembering to remove the soufflé from the oven without so much as a timer, my friends. There were incredible smells and open grill flames and other sensory delights. Seriously. 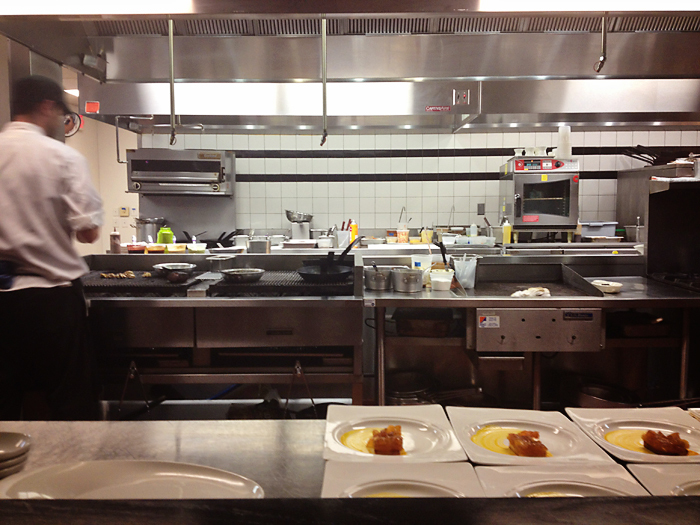 If you get the chance to sit in front of an open restaurant kitchen, take it. It’s better than any dinner theater. Overall, the food more than made up for our rough start. We may have judged our original server a little harshly. The rest of the dining room never did fill up, which makes me realize that places with excellent food are almost doing themselves a disservice by providing ample seating. They should keep it small. Intimate. Maybe a little exclusive, even. If you’ve been denying yourself the chance to spend your hard-earned cash on a meal that is so totally worth it, check out [ONE] in Chapel Hill, North Carolina. Request food bar seating, unless they decide to improve the atmosphere of the dining room any time soon. If you’re the type of person who expects the price to reflect portion size, don’t bother going. You will be disappointed. But if you’re looking for a real culinary experience — the kind that leaves incredible flavors lingering on your tongue well after you’ve swallowed that last bite, then this is for you. This is a place that will ruin other modestly high-end restaurants for us for years to come. And I can’t necessarily say that’s a bad thing. Have you ever had a foodgasm experience that just completely blew your pants off? Let me know. I’ll add it to my list. I was totally cracking up before I even got into the meal. I wonder how many people know who Ron Jeremy is these days ;-) I saw him from a distance last year during an event I had to go to during a cinema tradeshow, he hasn’t aged well, but you can’t (or at least I couldn’t) help but stare. My hubby and I rarely where anything more than nice jeans and a sweater to a resto, but I have a very assertive hubby, so if he doesn’t like a table, he’ll let them know (I would just take whatever!). And we absolutely LOVE sitting at the bar and watching the action, best spot in the world! 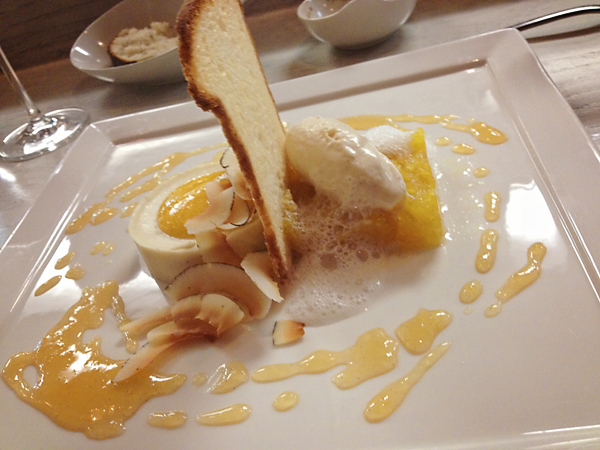 The food looks really good, but that dessert, wow! Amazeballs! Looks so yummy!! Not much in the way of culinary experiences here, so I will live vicariously through you :) PS – I had to google “horchata” – hopefully I am not the only one! 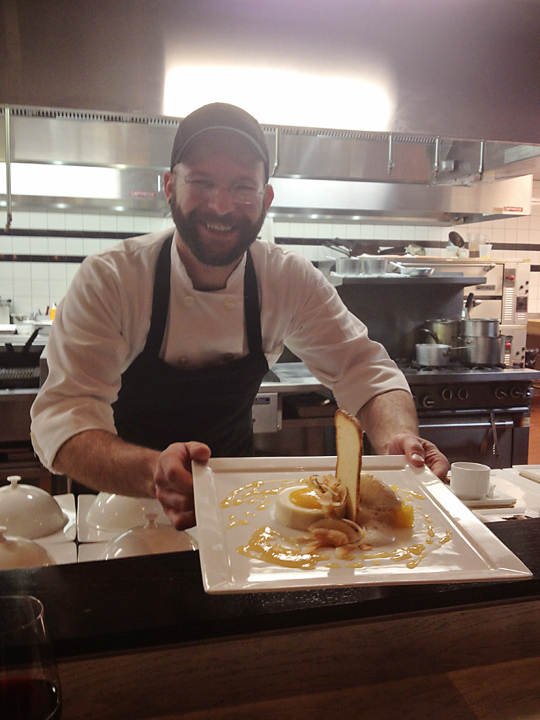 The dessert chef’s name is Justin…really! I’m gutted you thought I was condescending…not my intent at all…and I was thrilled you moved to the food bar cuz so many stare wistfully but don’t have the guts to do it! Yes, lots of terms on the menu that even we have to Google so you’re in good company. :) We’re constantly looking to improve so will take your observations under advisement, and no offense, hope you leave some photo tool in the area again soon so you’ll drop in to eat again. 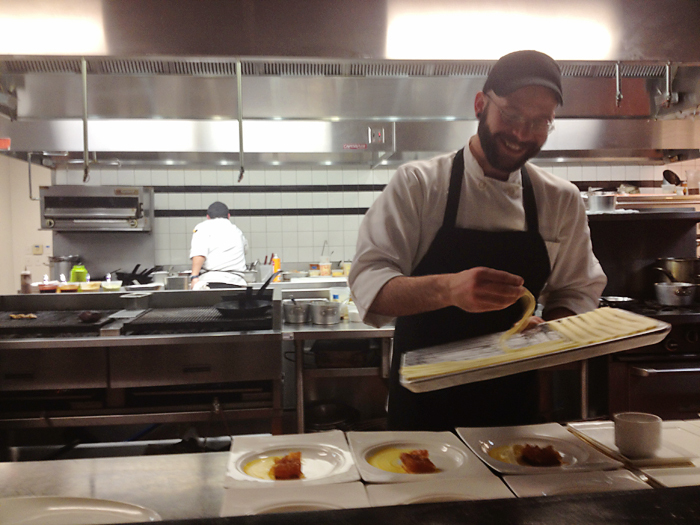 Sean tweaks the menu constantly…great for adventurers like you two! Oh, no! You found me! And you’ve used the term “gutted,” which is one of the absolute last adjectives I’d ever make you want to feel. Going back and re-reading what I wrote, let me clarify: The way we felt was VERY likely due to the fact that we kind of felt snubbed from the get-go. From the hostess telling us they were about to fill up (which it never did physically, but maybe for the number of servers?) and then sticking us in the back of an empty dining room, it didn’t feel comfortable. Add to that our own insecurities about dining at places where the chefs and servers are so incredibly knowledgable about food, I think you made us feel overwhelmed (even though in retrospect, you were probably just trying to put us at ease). Seriously — your vast knowledge of the food and wine was incredible, and exactly what a place like that needs when it comes to serving serious foodies. You would be Alton Brown’s first pick for a food trivia competition. So. I guess the point I was trying to get across is that you are the perfect server for people who know what they’re doing. But for us, it was a little overwhelming. :) I did say at the end of the post that our initial discomfort probably made us judge you too harshly, and now I’m convinced. I hope you’ll accept my apology, and as someone who has waited many a table, I want you to know that I was blown away by your professionalism and knowledge. Keep doing what you do! Apology accepted. Not necessary, but gratefully accepted. And by the way, Alton Brown would not pick me….every trivia answer would somehow circle around to dessert (as all things should, frankly), but thanks for the props. 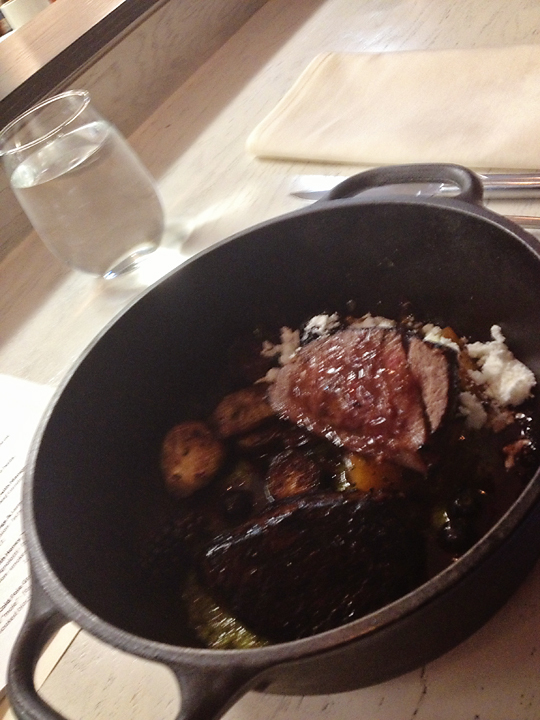 Sean’s food is yummy and interesting, and like you two, I like to eat and like to know something about what I’m eating. Thank the gods for Google and Wikipedia! No place is perfect – we’ll keep ironing out the wrinkles. But we’ll make sure we stay $-sign free, and adventurous. You two keep eating and posting! Display kitchens are a lot of fun. I live in Denver, so I’m glad to hear that you like Biker Jim’s….they can do crazy fun things to a ‘dog. First time visiting your blog. Cheers! I love it when people comment on older posts! Now I’m craving a Wellington dog. Did you see the post about the chalk festival last year? That was pretty cool! Thanks for stopping by, Jenni – I hope you stick around!